Anyone else on the Stage 2 Diwan run tonight? Another night when we don't know where they are. 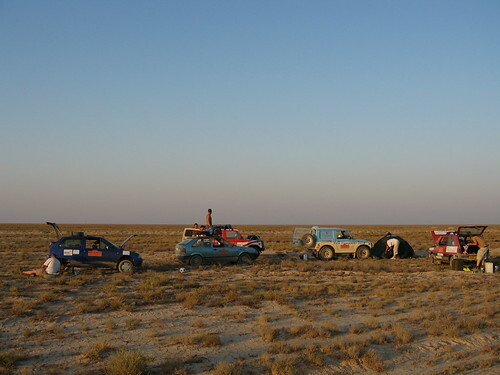 Judging by this pic from the Mongol rally a year or so ago the camping space is vast but facilities minimal. 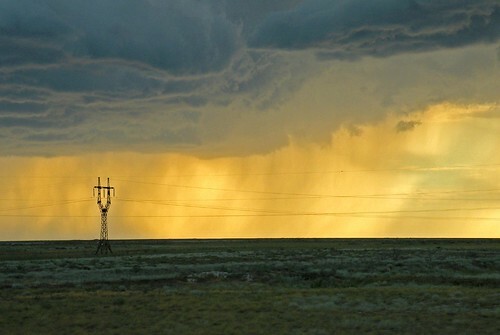 Looking at GE its amazing the way that the desert suddenly gives way to rich greenery as they plunge down into the Khiva valley and the bed of the old Aral Sea. I wonder if they'll make a diversion to see the stranded ships? 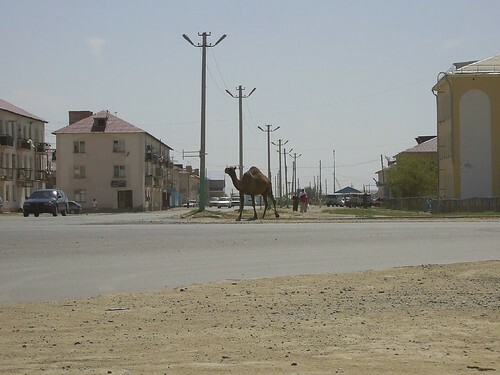 I'm off to Wales tomorrow, so no virtual ROTW til Thursday, by which time they should be in Bukhara. Just back from seeing Ruth in Lord of the Flies at Stage 2. Good production - especially the deaths! Really into the desert now, and hopefully they can get across the border in a day - I wouldn't fancy camping out there. GE shows the whole area full of tracks radiating out of distant oases, it looks like craters on the moon. And this is the border post, note the trucks queuing on the Kazak side. Meeting in Digbeth then drop a BBQ off at St Basils. Like my old Newsglobe but on steriods. Done by CASA who did the 3D London, and who like our Google Maps in SL. The landscape is suddenly desert - although the camel is probably a bit of a give away! Looking on Google Earth Beyneu (about the size of Moseley, we checked) has a whole bunch of buildings with bright red roofs - metal anti-rust paint I suppose - perhaps Deb's can enlighten us. 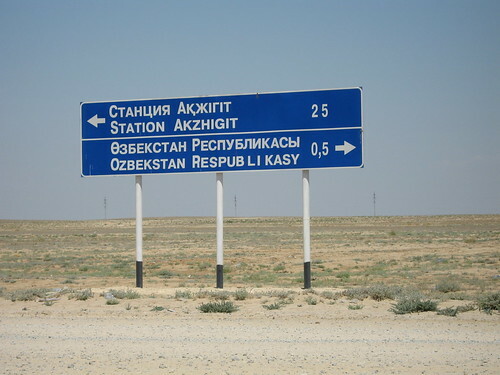 It also looks to be at a major rail junction, one back to Astrakhan, one further S into Kazakhstan and one on to Uzbekhistan which it looks like the road follows pretty closely. 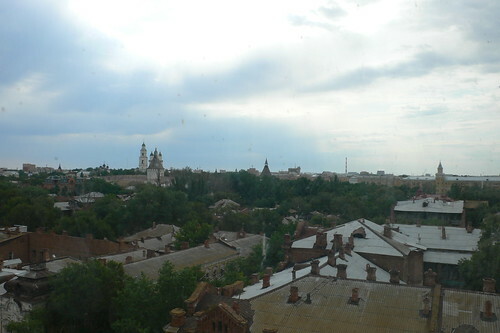 Astrakhan, and Europe is being left behind as the deserts of central Asia approach. 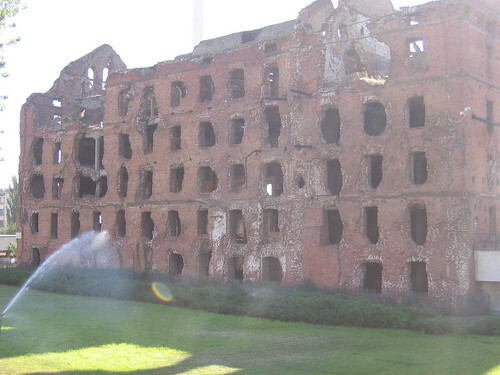 They did get to Volgograd last night after all. Deb talks about "There is the most incredible memorial to the Russian dead of the Battle of Stalingrad" - I guess its probably the first picture above having looked on Google Earth, although I must admit I'd expected something more like the second (also at the memorial), although it may have even been the more grecian looking thing. Wall-E was superb. A Silent Running for the 21st Century, with lots of references to 2001. Deserves an Oscar. aah, the weekend. And rain, so no need to mow the lawn! Relaxing at the cottage, still trying to make myself like Whisky. The girls and I had a nice afternoon climbing on Froggat - the first time I've taken them out climbing on my own outdoors. We couldn't find the climbing guide in the cottage so we've no idea which route we were on, but they both did two climbs each, and not easy by the look of things. It didn't even rain, although it was a bit blowy belaying up on the top. Given Deb's text (see www.converj.com/rotw) is sounds like they only made the Russian border today, not yesterday. 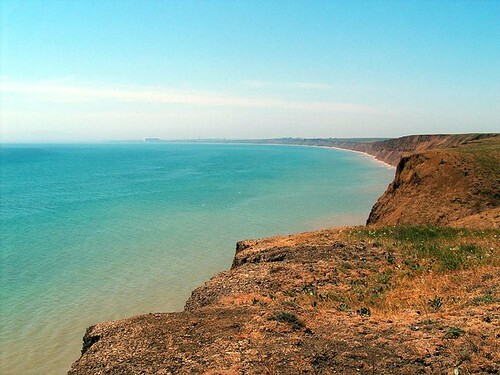 So here's a nice pick of the north coast of the Sea of Azov which they'll have been following all day (and yesterday probably). And into Russia! 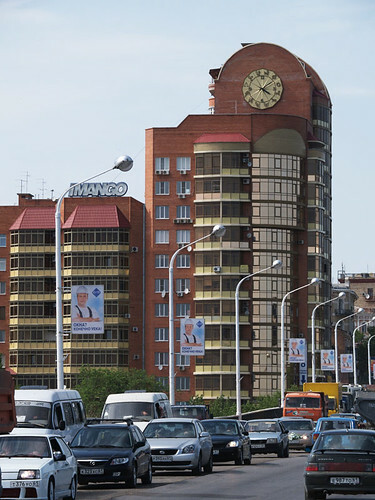 Facade clock in Rostov overlooking the Don. 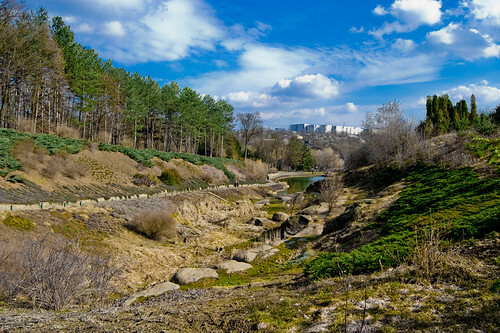 Another major Russian river, just upstream of where is flows into the Sea of Azov. James Wagner Au (aka Hamlet Au) bumped into our Abi chatbot when visiting our sim recently and wrote a lovely piece about her in New World Notes. 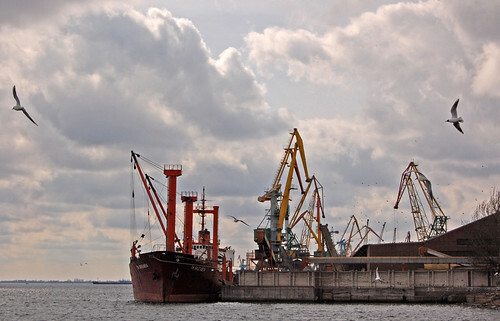 A very industrial looking place down by the Black Sea. Down by the mighty Dneiper, close to where it flows into the Black Sea, and to the Crimea. The Dneiper had some special significance in Warsaw Pact/Nato days and was I think the setting for many a big Pact exercise, when it was probably standing in for the Rhine. Still no news from the team - arriving to late to find cybercafe's I guess. 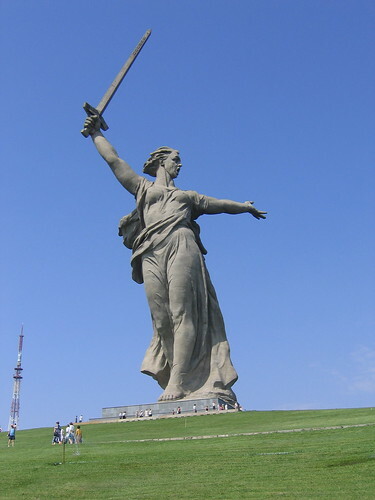 Next rest day is in Volgograd, Russia. 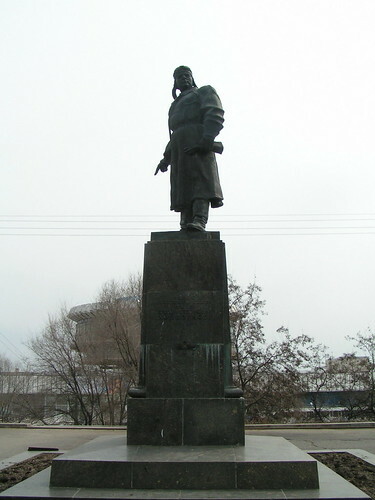 Looks like the main feature of Uman is the Sofiyivsky Park. Hopefully launching our web browser for SL today - assuming @SoullaStylianou and I can agree what colour it should be! 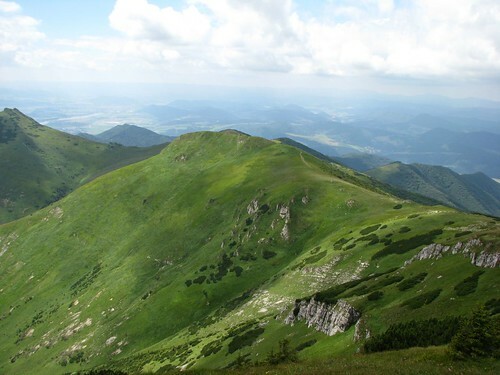 Slovakia/Ukraine Border. They should have reached here this evening. Shipping Ruth down to my parents today, then its just Jo and I in the house all week. It's feeling very empty. Terchova, Slovakia Seeing as there isn't much activity on the ROTW2008 blog (!) I thought I'd keep a virtual blog here, using the Google Earth and Flickr mash-up to choose pictures of where the team should be. Good list of 3D technologies out there. What's interesting with OpenSim is the way that its beginning to divorce 3D graphics from the actual protocols, so you can use your 3D engine of choice - as RealXtend have done. Would it be possible to do the same thing with one of these web/flash based systems and put it in an OpenSim/SL wrapper? One feels the metaverse getting closer. http://getsatisfaction.com/ - the Web 2.0 support application for Web 2.0 services? Ququestion to Web 2.0 brummies - anyone doing any interesting in terms of using Web 2.0 to share/promote/sell music, esp older styles. Deborah and the team left for Mumbai about 1130 this morning. We drove down in the rain and helped load the vehicles and then waved goodbye in the rain. All being well they'll be in Dunkerque now. It's going to be strange not having Deborah around for 10 whole weeks. I still can't decide whether its better or worse that I've got the kids through the holidays rather than during term time. With term it would be easier just to settle into a routine, but at least with holiday they've got the opportunity to go off and do things and take their minds off the fact that Deb's not around - and give me a break. We'll see how it pans out. Ruth finishes term on Friday anyway. You can keep track of Deborah's journey on her blog and team web site. Jo helping to load the Landcruisers. Deb and the rest of the group will be blogging the trip at www.converj.com/ROTW/, complete with Google Earth mash-up of course! Getting ready to take Deb down to Gloucester to start her overland trip to Mumbai. 10 weeks away! Weekend spent getting Deborah ready for The Big Trip. SL Bot day again today - lets crack giving inventory and sitting on objects by name. Hurrah! Had my paper on AI in SL accepted for the BCS AI Conference in Cambridge in December. "The Calais Web Service automatically creates rich semantic metadata for the content you submit - in well under a second. Using natural language processing, machine learning and other methods, Calais analyzes your document and finds the entities within it. But, Calais goes well beyond classic entity identification and returns the facts and events hidden within your text as well." And it's from Thomson Reuters! Now couldn't a bot have fun with that! The start of a quick surf trail. Similar concept to BBC Backstage and what we've also been suggesting to Digital Birmingham. Just had second breakfast. Was up at 4.45am to drop Jo at school for a trip to the Somme. Big difference in traffic between 5.15 and 5.45. Thanks to Digital Urban for the heads up on this great data visualisation tool using Google Earth. More at http://thematicmapping.org/. At Apres on Summerrow sending out the July newsletter (yes I know I said we'd do it Tuesday). 12" sausage baguette and 1/2 pt IPA for lunch. Just finished off the Data Viz panel for Second Life's 5th Birthday. Linden Lab asked us to organise it and we were fortunate to get Xanthe Oe who runs the data viz wiki and plot on Sci Lands to actually to the hard graft and pull the speakers together and chair it (thanks Melanie). It was a great panel with a full auditorium and speakers from IBM, Gren Phosphor, UoPlymouth and UoMichigan. After the session we took people on a tour, first to our Briefing Hub and then DataViz on Scilands. Even Pathfinder Linden and prolific twitter Mal Burns found time to join the tour. Just got my browsable web prim working in SL - and no one around to show it to!